This article is about the Greek dialect. For the Greek people, see Cappadocian Greeks. Not to be confused with the Ancient Cappadocian language. Cappadocian, also known as Cappadocian Greek or Asia Minor Greek, is a mixed language spoken in Cappadocia (Central Turkey). The language originally diverged from the Medieval Greek of the Byzantine Empire following the Seljuq Turk victory at the Battle of Manzikert in 1071. As a result of the population exchange between Greece and Turkey in the 1920s, all Cappadocian Greeks were forced to emigrate to Greece where they were resettled in various locations, primarily to Central and Northern Greece. The Cappadocians rapidly shifted to Standard Modern Greek and their language was thought to be extinct since the 1960s. In June 2005, Mark Janse (Ghent University) and Dimitris Papazachariou (University of Patras) discovered Cappadocians in Central and Northern Greece who could still speak their ancestral language fluently. Many are middle-aged, third-generation speakers who take a very positive attitude towards the language, as opposed to their parents and grandparents. The latter are much less inclined to speak Cappadocian and more often than not switch to Standard Modern Greek. Anatolian Greek dialects until 1923. Demotic in yellow. Pontic in orange. Cappadocian in green, with green dots indicating individual Cappadocian Greek villages in 1910. By the fifth century AD, the last of the Indo-European native languages of Asia Minor ceased to be spoken, replaced by Koine Greek. At the same time, the communities of central Asia Minor were becoming actively involved in the affairs of the Greek-speaking Eastern Roman Empire, and some (now Greek-speaking) Cappadocians, such as Maurice Tiberius (r. 582-602) and Heraclius (r. 610 to 641), would even rise to become Emperors. Cappadocian Greek first began to diverge from the Medieval Greek common language of the Eastern Roman (Byzantine) Empire six centuries later, following the Byzantine's defeat at the Battle of Manzikert in 1071. This defeat allowed Turkish speakers to enter Asia Minor for the first time, severing Cappadocia from the rest of the Byzantine world. By the 20th century Cappadocian Greek would come to be heavily influenced by Turkish, but unlike Standard Modern Greek, it would not be influenced by Venetian and French from the Frankokratia period, which followed the Fourth Crusade's sack of Constantinople in 1204. The earliest records of the language are in the macaronic poems of Jalal ad-Din Muhammad Rumi (1207-1273), who lived in Iconium (Konya), and some ghazals by his son Sultan Walad. Interpretation of the Greek language texts is difficult as they are written in Arabic script, and in Rumi's case without vowel points; Dedes' edition (Δέδες) is the most recent edition. By the early 20th century many Cappadocians had shifted to Turkish altogether (written with the Greek alphabet, Karamanlidika). Where Greek was maintained (numerous villages near Kayseri, including Misthi, Malakopea, Prokopion, Karvali, and Anakou), it became heavily influenced by the surrounding Turkish. However, there are next to no written documents in Medieval or early Modern Cappadocian, as the language was, and still essentially is, a spoken language only. Those educated to read and write, such as priests, would do so in the more classicising literary Greek. The earliest outside studies of spoken Cappadocian date from the 19th century, but are generally not very accurate. One of the first documented studies was Modern Greek in Asia Minor: A study of dialect of Silly, Cappadocia and Pharasa (Cambridge: Cambridge University Press, 1916), by Richard MacGillivray Dawkins (1871–1955), the first Bywater and Sotheby Professor of Byzantine and Modern Greek Language and Literature at the University of Oxford, based on fieldwork conducted by the author in Cappadocia in 1909–1911. After the population exchange, several Cappadocian dialects have been described by collaborators of the Center for Asia Minor Studies (Κέντρον Μικρασιατικών Σπουδών) in Athens: Uluağaç (I.I. Kesisoglou, 1951), Aravan (D. Phosteris & I.I. Kesisoglou, 1960), Axo (G. Mavrochalyvidis & I.I. Kesisoglou, 1960) and Anaku (A.P. Costakis, 1964), resulting in a series of grammars (although regrettably not all Cappadocian villages were covered). In recent years, the study of Cappadocian has seen a revival following the pioneering work on Language Contact, Creolization, and Genetic Linguistics (Berkeley: University of California Press, 1988) by Sarah Grey Thomason and Terrence Kaufman, and a series of publications on various aspects of Cappadocian linguistics by Mark Janse, professor at Roosevelt Academy, who has also contributed a grammatical survey of Cappadocian to a forthcoming handbook on Modern Greek dialects edited by Christos Tzitzilis (Aristotle University of Thessaloniki). The recent discovery of Cappadocian speakers by Janse and Papazachariou will result in the release of a new dictionary and a compilation of texts. Cappadocian Greek is well known from the linguistic literature as being one of the first well documented cases of language death, and in particular the significant admixture of non-Indo-European linguistic features into an Indo-European language. This process was pronounced in South-Western Cappadocia, and included the introduction of vowel harmony and verb-final word order. The Greek element in Cappadocian is to a large extent Byzantine, e.g. θír or tír "door" from (Ancient and) Byzantine Greek θύρα (Modern Greek θύρα), píka or épka "I did" from Byzantine Greek έποικα (Modern Greek έκανα). Other, pre-Byzantine, archaisms are the use of the possessive adjectives mó(n), só(n) etc. from Ancient Greek εμός, σός etc. and the formation of the imperfect by means of the suffix -išk- from the Ancient Greek (Ionic) iterative suffix -(e)sk-. Turkish influence appears at every level. The Cappadocian sound system includes the Turkish vowels ı, ö, ü, and the Turkish consonants b, d, g, š, ž, tš, dž (although some of these are also found in Greek words as a result of palatalization). Turkish vowel harmony is found in forms such as düšündǘzu "I think", aor. 3sg düšǘntsü < düšǘntsi (Malakopi), from Turkish düşünmek, patišáxıs < patišáxis "king" (Delmeso), from Turkish padişah. Cappadocian noun morphology is characterized by the emergence of a generalized agglutinative declension and the progressive loss of grammatical gender distinctions, e.g. to néka "the (neuter) woman (feminine)", genitive néka-ju, plural nékes, genitive nékez-ju (Uluağaç). Another Turkish feature is the morphological marking of definiteness in the accusative case, e.g. líkos "wolf (nominative / unmarked indefinite accusative)" vs. líko "wolf (marked definite accusative)". Agglutinative forms are also found in the verb system such as the pluperfect írta ton "I had come" (lit. "I came I was") (Delmeso) on the model of Turkish geldi idi (geldiydi). Although Cappadocian word order is essentially governed by discourse considerations such as topic and focus, there is a tendency towards the Turkish subject–object–verb word order with its typological correlates (suffixation and pre-nominal grammatical modifiers). The commonality among all Greek Cappadocian dialects is that they evolved from Byzantine Greek under the influence of Turkish. On the other hand, those dialects evolved in isolated villages. This has resulted in a variety of Greek Cappadocian dialects. Although Cappadocian Greek was once believed to be a dead language, the discovery of a population of speakers has led to an increase in awareness, both within and outside of the Cappadocian community in Greece. In the documentary “Last Words,” which follows Mark Janse through Cappadocian-speaking villages on the Greek mainland, community members are seen encouraging each other to use their dialect for ordinary things, such as joke telling. The members of these villages, including such notable figures as the bishop, recount being touched by a presentation given in Cappadocian by Janse on a visit to the region. The bishop went so far as to say that Janse’s speech “has lifted their shame.” The revitalisation process is seen through examples such as this, wherein the speakers have begun to take back their identity and embrace their mother tongue. Additionally, younger generations are embracing the power of technology to spread awareness, utilising social media about the language to inform the larger Greek population. ^ Hammarström, Harald; Forkel, Robert; Haspelmath, Martin, eds. (2017). "Cappadocian Greek". Glottolog 3.0. Jena, Germany: Max Planck Institute for the Science of Human History. ^ Janse, Mark. "The Resurrection of Cappadocian (Asia Minor Greek)". Αω International: 3. Retrieved 2016-09-16. ^ "Laboratory of Ancient Greek Dialects". University of Patras. Retrieved September 30, 2016. ^ Stark, Freya (2012). Rome on the Euphrates: The Story of a Frontier. Tauris Parke Paperbacks. p. 390. ISBN 978-1-84885-314-0. Byzantium reverted to Greek (Maurice, born in Cappadocia, was its first Greek emperor); and trade and diplomacy were honored from the very founding of the Imperial city as never in Rome before. ^ Corradini, Richard (2006). Texts and identities in the early Middle Ages. Verl. der Österr. Akad. der Wiss. p. 57. ISBN 978-3-7001-3747-4. Emperor Maurice who is said to be the first emperor "from the race of the Greeks," ex Graecorum genere. ^ "Rumi". Khamush.com. 2004-05-09. Retrieved 2016-05-14. ^ Burguière, P. 1952. Quelques vers grecs du XIIIe siècle en caractères arabes. Byzantion 22: 63–80. ^ Güzelyurt becomes a touristic hub. AKSARAY - Anatolia News Agency. July 17, 2012. In the town of Güzelyurt in Aksaray Province in the Central Anatolian region of Turkey, 250-year-old arched stone mansions have been transformed into boutique hotels to serve tourists coming to discover the area’s cultural and historical treasures. The town is an important part of the historical Cappadocia region…Much of the previously large Greek population in Güzelyurt vanished with the population exchange of the 1920s. "With the population exchange in 1924, Greeks and Turks exchanged places. Before the population exchange, rich Greeks dealing with trade in Istanbul had historical mansions in Güzelyurt," Özeş said. Some houses in the town date back 250 years and a few 100-year-old historical houses also exist, according to Özeş. "They have extremely thick walls. The height of the arches is nearly four to five meters. Each of the houses is a work of art creating an authentic environment." ^ "Modern Greek in Asia Minor; a study of the dialects of Siĺli, Cappadocia and Phárasa, with grammar, texts, translations and glossary : Dawkins, R. M. (Richard McGillivray), 1871-1955 : Free Download & Streaming : Internet Archive". Retrieved 2016-05-14. Costakis, A. 1964. Le Parler Grec d'Anakou. Athens: Centre d'Études d'Asie Mineure. Costakis, A. 1968. Το γλωσσικό ιδίωμα της Σίλλης. Athens: Centre d'Études d'Asie Mineure. Janse, M. 1994. Son of Wackernagel. The Distribution of Object Clitic Pronouns in Cappadocian. Irene Philippaki-Warburton, Katerina Nicolaidis & Maria Sifianou (eds. ): Themes in Greek Linguistics. Papers from the First International Conference on Greek Linguistics, Reading, September 1993 (Current issues in Linguistic Theory, 117. Amsterdam: Benjamins. 435–442. Janse, M. 1997. Synenclisis, Metenclisis, Dienclisis. The Cappadocian Evidence. Gabriel Drachman, Angeliki Malikouti-Drachman, Jannis Fykias & Sila Klidi (eds. ): Greek Linguistics ’95. Proceedings of the 2nd International Conference on Greek Linguistics (Salzburg, 22–24 Sept. 1995. Graz: Neugebauer. 695–706. Janse, M. 1998a. Cappadocian Clitics and the Syntax-Morphology Interface. Brian D. Joseph, Geoffrey Horrocks & Irene Philippaki-Warburton (eds. ): Themes in Greek Linguistics II (Current Issues in Linguistic Theory, 159). Amsterdam: Benjamins. 257–281. Janse, M. 1998b. Grammaticalization and Typological Change. 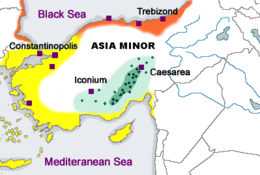 The Clitic Cline in Inner Asia Minor Greek. Mark Janse (ed. ): Productivity and Creativity. Studies in General and Descriptive Linguistics in Honor of E.M. Uhlenbeck (Trends in Linguistics. Studies and Monographs, 116). Berlin: Mouton de Gruyter. 521–547. Janse, M. 1998c. Le grec au contact du Turc. Le cas des relatives en Cappadocien. In Caron, B. (ed. ), Proceedings of the 16th international congress of linguistics, 20–25 July 1997. Amsterdam: Elsevier Science. Paper no. 338. Janse, M. 1999. Greek, Turkish, and Cappadocian Relatives Revis(it)ed. Amalia Mozer (ed. ): Greek Linguistics ’97. Proceedings of the 3rd International Conference on Greek Linguistics. Athens: Ellinika Grammata. 453–462. Janse, M. 2001a. Morphological Borrowing in Asia Minor. Yoryia Aggouraki, Amalia Arvaniti, J.I.M. Davy, Dionysis Goutsos, Marilena Karyolaimou, Anna Panagiotou, Andreas Papapavlou, Pavlos Pavlou, Anna Roussou (eds. ), Proceedings of the 4th International Conference on Greek Linguistics (Nicosia, 17–19 September 1999). Thessaloniki: University Studio Press. 473–479. Janse, M. 2001b. Cappadocian Variables. Mark Janse, Brian D. Joseph & Angela Ralli (eds. ), Proceedings of the First International Conference of Modern Greek Dialects and Linguistic Theory. Patras: University of Patras. 79–88. Janse, M. 2002. Aspects of Bilingualism in the History of the Greek Language. J.N. Adams, Mark Janse & Simon Swain (eds. ), Bilingualism in Ancient Society. Language Contact and the Written Word. Oxford: Oxford University Press. 332–390. Janse, M. 2004. Παλιό κρασί σε καινούρια ασκιά. Τουρκοελληνικά «αναφορικά» στην κεντρική Μικρασία. Νεοελληνική διαλεκτολογία. Τόμος 4ος. Πρακτικά του Τέταρτου Διεθνούς Συνεδρίου Νεοελληνικής Διαλεκτολογίας. Αθήνα: Εταιρεία Νεοελληνικής Διαλεκτολογίας. 173–182. Joseph, B.D. 1997. Cappadocian Greek αρέ 'now' and related adverbs: The effects of conflation, composition and resegmentation. Στο Φιλερήμου Αγάπησις: Τιμητικός Τόμος για τον καθηγητή Αγαπητό Γ. Τσοπανάκη. Ρόδος: Στέγη Γραμμάτων και Τεχνών Δωδεκανήσου. 115–122. Karatsareas, Petros. 2009. The loss of grammatical gender in Cappadocian Greek. Transactions of the Philological Society 107, 2: 196–230. Kooij, Jan G. & Revithiadou, Anthi. 2001. Greek Dialects in Asia Minor. Accentuation in Pontic and Cappadocian. Journal of Greek Linguistics 2: 75–117. Ralli, A. 2009. Morphology meets Dialectology: insights from Modern Greek Dialects. Morphology 19 (2): 87–105. Ralli, A. 2012. Morphology in language contact: verbal loanblend formation in Asia Minor Greek. In M. Vanhov et al. eds. Morphologies in Contact, 177–194. Revithiadou, Anthi. 2006. Prosodic Filters on Syntax. An Interface Account of Second Position Clitics. Lingua 116: 79–111. Δέδες, Δ. 1993. Ποιήματα του Μαυλανά Ρουμή. Τα Ιστορικά 10.18–19: 3–22. Meyer, G. 1895. Die griechischen Verse in Rabâbnâma. Byzantinische Zeitschrift 4: 401–411. Mertzios, C.D. 1958. Quelques vers grecs du XIIIe siècle en caractères arabes. Byzantinische Zeitschrift 51: 1516. Burguière, P. 1952. Quelques vers grecs du XIIIe siècle en caractères arabes. Byzantion 22: 63–80.